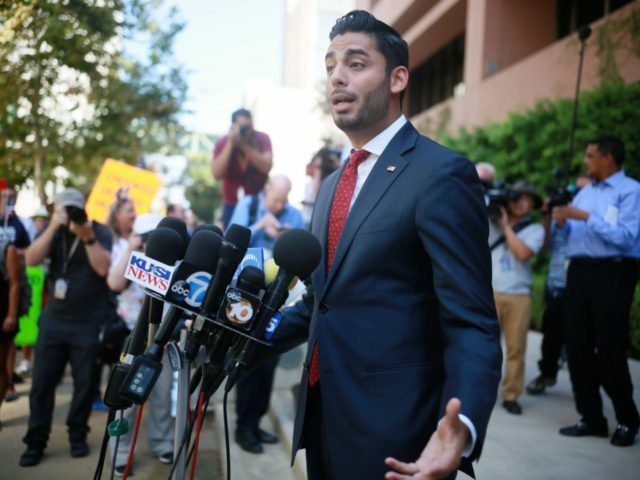 Democratic Party congressional candidate Ammar Campa-Najjar legally changed his name on June 12, 2018 — one week after the California primary — from “Ammar Yasser Najjar” to “Ammar Joseph Campa-Najjar,” Breitbart News has learned. Campa-Najjar is running in California’s 50th congressional district to unseat Rep. Duncan Hunter (R-CA), who is facing a federal indictment for misuse of campaign funds. Court documents provided to Breitbart News indicate that Campa-Najjar officially changed his name on June 12, 2018. He originally filed for the name change in January, but missed a court date in April due to travel plans. Campa is Ammar’s mother’s maiden name — which pays homage to the family he knew. Adding Campa reveals more of who Ammar is to voters, not the other way around. Hence, he’s gone as Ammar Campa-Najjar for years. With that name, he worked at the White House and U.S. Department of Labor and had a full background check with security clearance. Additionally, when he met Trump and other important people during his time in Washington, this was the name everyone called him. Ammar is proud to be a Campa, it’s the family he knew most – more information on his grandpa Celso Campa is below [in the email] from a news release we sent out in August. Ammar is the son of a Christian working-class single mother who raised him with help from family and neighbors. One more thing I’d like to add: as his Jewish director of communications, the insinuations that have been made around his name change are frankly absurd and classless. Singer did not respond to follow-up questions, including a question about why Campa-Najjar had waited until 2018 to change his name. Though Singer claims that Campa-Najjar has used his current name publicly, he has apparently preferred to use “Ammar Campa” for campaign purposes. His campaign website is “CampaCampaign.com,” again omitting his full name and using a surname that was not legally part of his name until June. Whois.com indicates that the domain was registered in April 2017. Campa-Najjar’s Twitter handle is “ACampaNajjar,” but his profile describes him as “Ammar Campa,” omitting his full legal surname. His Facebook page is also “Ammar Campa for Congress” (though the web address for the page includes “Najjar”). Najjar has built a national profile as the first “Latino Arab-American” to run for Congress. His mother is Mexican-American and his father is Palestinian-American. Campa-Najjar may not have broken California election laws, since candidates are often permitted to use the name by which they are publicly known, even if it is not their exact legal name. Election lawyer Steve Duvernay told Breitbart News that a candidate can likely use any “genuine variation” on his or her name. However, it is unusual for candidates to change their legal names during an election. He has, at least, changed his name.